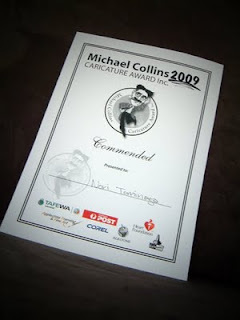 No, no speeches here, but thankyou to the MCAA for commending me for a couple of my pieces for 2009. There were some absolutely draw dropping artists including Luke Watson, Simon Schneider, David Rowe - the list goes on and on. Just fantastic! you... are a super star! congrats mate! Woow! Nice one, man! Congratulations! Congratulations Nori - highly deserved mate ! BTW, I am in Melbourne now. I have been here a month, but been pretty busy with family and Christmas! Anyhoo, Ill be around another few weeks, so let me know if youre still up for some drawing!